Girgaum, also called Girgaon, is an area in southern Mumbai in Maharashtra, India. Kristian Bertel takes you through the diverse and varied culture in Girgaum in this blog post. Like most areas of cosmopolitan Mumbai, residents span diverse languages, religions, traditions, festivals and attire. Girgaum occupies prime residential real estate due to increasing demand just because of its prominent location in South Mumbai. The Sanskrit term 'Giri' stands for hills, whereas the Sanskrit word 'gram' denotes a village. Thus, Girgaum means a village at the foothill of mountains. A birds' eye view from the top of Malabar Hill will justify this etymological finding. The portrait is read with similar purpose and intensity, where we search it for clues through which we might know the experience and conditions of the person shown and perhaps draw from it conclusions about ourselves. It was once said that the face reveals what words may hide. For the photographer the face provides a wordless entry to the truths of the matter and perhaps to the soul. Portrait photography is one of the most popular and the most complicate photography genres ever because it takes both your photography and people skills to make a great portrait photo. Natural light is probably one of the fewer things that alone can make the photo beautiful on its own. It is so nice to see soft natural light on a photo, which helps the picture look so candid and lets you plunge into its warm atmosphere full of golden sun rays that make you feel at home. Some of the street portraits are taken with a wide-angle lens. This is a portrait format that can be used to point at certain features of the photographer's subject with the help of the background in an Indian street. 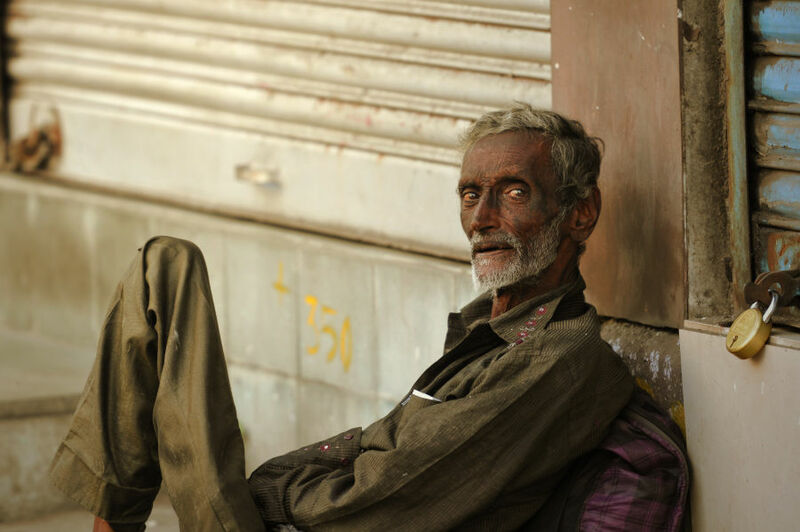 The photographer used a wide-angle lens and photographed the subject against a plain one-colored background and took photos in some place that also associated with his subjects in the streets of Girgaum like in this portrait of a man with striking eyes in Girgaum, Mumbai. As pictured above in this blog post, you can see a photo of a man with striking and light eyes. It is not the normal eye color in India, where the most eyes are brown. Light eyes are common in parts of north west India, where the people have more western Eurasian genes. Geographically the country of India is not far away from Afghanistan, where green eyes can be pretty common, so the most likely scenario is that light eyes were carried to India via ancient trade routes when cultures would meet to do transactions on the silk road. During the 'Indo-Aryan' migrations groups were documented to have bright blue and green eyes but mixing with the Indian population would result in the dilution of those genes, and thousands if not millions of Indians could hypothetically produce at least green and hazel eyes. "- I was stunned by meeting this man with these eyes. Another thing that striked me was, that he was so thin, just take a look at his ancles", the photographer says. It is not really important whether the photographer would like to make a photo of someone outdoors in his city or if he is traveling to another country like India since it will be difficult anyway. The photographer's approach to street portraits in India is always to smile and to be polite and remember that in some cases a simple nod will be allright, whilst in other situations it will be necessary to approach people and talk to them. "- They say that street portrait photography is art because the photographer both needs to capture the right moment and do so without intruding into the subject's personal space, even if the subject is not someone you know. Most of my photos are grounded in people and I try to convey what it is like to be that person, like the man on the pavement portrayed in Girgaum. He is a person caught in a broader landscape that I guess you will call the human condition", the photographer says. 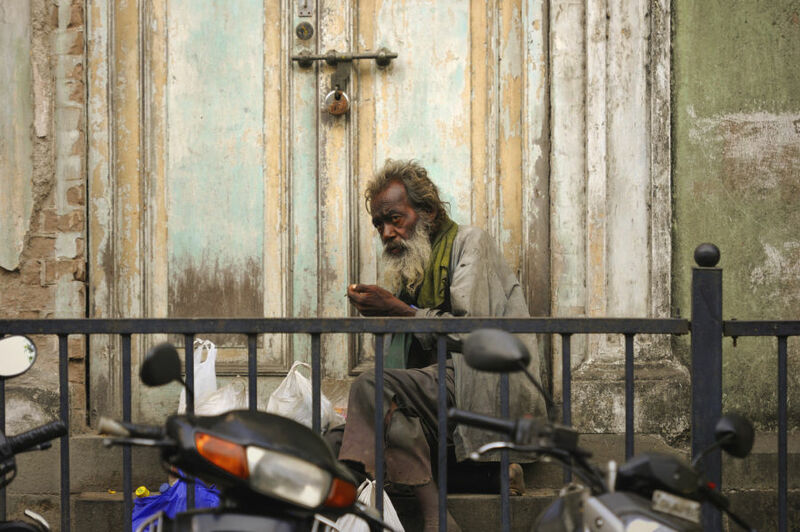 This is one of the photographer's other street portraits from Girgaum in Mumbai, India. For the photographer, photographs are not so much about art as about telling a story or holding on to a memory about the way things used to be. For him, creating photographs is a straightforward matter. When moving around in Mumbai one can get the clear impression that this city is India's commercial capital with several stock exchanges and banks, and the city's deep natural harbor provides good transport facilities. 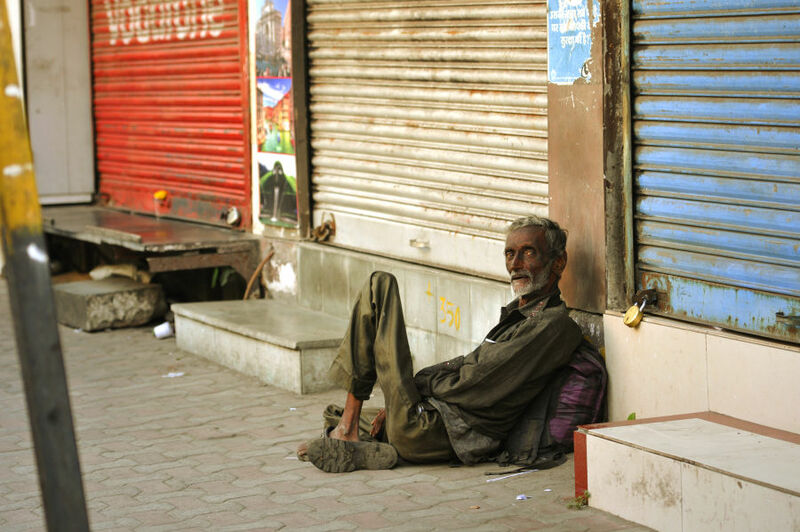 But having said that, poverty is evident in Mumbai. At the photographer's recent trip to India his pictures often tell the story of the great poverty, which clearly can be seen in Mumbai. Here in Mumbai, the country's largest city, more than half of city residents either live in large slum areas, in squalid hovels along the major roads, or wherever they can find room to spend the night on the street. But it is not only in slum areas, where you can clearly see the poor in this contrasting city but also here in the portraits from Girgaum. When seeing Mumbai from the outside it is a beautiful city with a skyline, as seen at dusk from the bridge by the sea, but the sight is quickly changed to an experience of maze-winding, dirty streets when the city is seen at close range. One can learn to accept it and get through it, if you try to embrace and try to understand the natural conditions of life in developing countries. After a while you will, like the photographer did, find yourself in the middle of a beautiful and often inspiring city, that can begin to be appreciated more and more. While Mumbai as a city can be chaotic and hectic, it need not be overwhelming. It has just its own rhythm, as it just takes some time to fall. And if one takes the time to explore this contrasting city and its many neighborhoods, you will get some memorable experiences that you will never forget. Mumbai is a city that attracts all types of people. It is India's financial center and home to much of the country's film industry, which is played cricket on weekends and relaxing on the beach. At the same time the city is known as having one of Asia's largest slums with a lot of poor people. Street photography is often returned with a smile too. When you browse through the portrait collection of the photographer Kristian Bertel, you will often see street portraits with a strain of sadness in them. Many of his portraits are a caught in the moment where his subjects have just seen him photographing them. This moment of portraiture is Kristian's favorite position because the photo situation and the expression on his subjects are not staged. Photo subjects that may look stunned and sad or surprised on the photographers pictures are actually often smiling back to the photographer afterwards. "- The world is not that sad when you look at it, though you walk in streets of poverty people are still smiling", the photographer says. When photographing street portraits in India the photographer also used the framing technique. 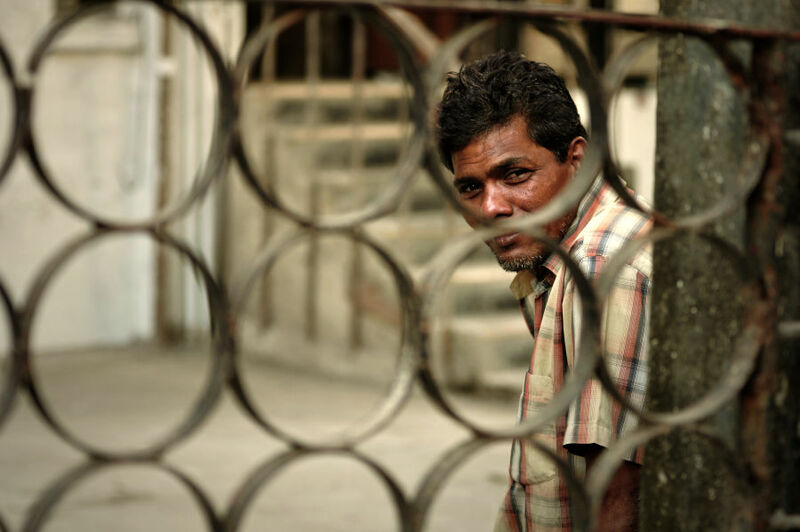 In this portrait of an Indian man, he has been photographed through the fence of a house. Foreground elements placed along the sides of the frame to lead the viewer's eye onto the subject and can be used to create a more closed and stable space in the frame. For the photographer and his street portraits in India and as seen here in Girgaum, it is often to focus the viewer's attention upon the subject, but the ends and means are ultimately at the discretion of the artist. Framing, especially in the photographic arts, is primarily concerned with the position and perspective of the viewer and the position of the observer has tremendous impact on their perception of the main subject, both in terms of aesthetics and in their interpretation of its meaning. If the viewer was placed very far away from a lone subject in one of the photographer's Indian portraits, the viewer will gather more information about the subjects' surroundings and bearing, but very little in terms of his emotions. If the setting was in the middle of flat plain, the viewer might perceive a sense of loneliness or that the subject is lost, because the viewer himself cannot find any visual cues to orient the location of the subject. If some foreground elements are put in front of the viewer, partially obscuring the subject, the viewer would take the position of an unseen observer. Kristian Bertel is a contributing photographer to the World Street Photography community. His photographs, many of them street portraits, portray the everyday life in India. As seen here in this blog post from Girgaum in Mumbai, India. "- I'm particularly fascinated by all the faces that I see in the streets. I was stunned by the man above, just laying there with his striking light eyes and thin legs", the photographer says. If you are interested to his photos from India, which also appears here in the community.